We are the leading manufacturer and exporter of Hydraulic SMC Moulding Press in all over the world. We offer customers Hydraulic SMC Molding Press that are precision designed for achieving optimum production of simple as well as intricate molding of Bakelite, Malamine, DMC/ SMC with ejection facility. These SMC Molding Press can also be availed in fully automatic as well as semi -automatic models. The soft opening just after turning point also helps in avoiding jerk movements. We can also make these available with electric heaters & control panels backed by digital temperature controller. These SMC Molding Press and Hydraulic SMC Molding Press are highly productive, durable & can also be availed in capacities ranging from 30 ton to 4000 ton as per customer's requirements. We are the leading manufacturer and exporter of Hydraulic Induction Press. The products molding of the profession of the hardware, techniques, mold copying etc. It is especially applicable to the empaistic of the unsticky hollow ware base and the technics of pressing stainless steel slice into induction cooker. The machine has fast cylinder, supercharge cylinder, main cylinder and independent cooling system, it is safe and convenient to be operated, can relize two kinds of operation modes (manual and semi auto control). In the semi —auto control mode, the moving table can finish the whole work circulation of fast up, pressing, auto-return, and stop return. Besides, it also has the advantage of high production efficiency and low energy consumption. It is equipped with the cooling system having independent filters. It is equipped with the light electricity protection equipment. 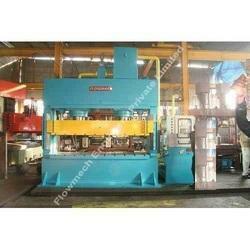 We are the leading manufacturer and exporter of Hydraulic Triple Action Hydraulic Deep Draw Presses. We offer a range of Triple Action Hydraulic Presses that are capable to bring revolution in deep draw processes. Our range of triple action hydraulic press is a high production press with high speed, 4 pillar type, and is used for long draw operation of sheet metal component. These triple action hydraulic presses are fully equipped with PLC or LVDT depth control, automatic photo sensor and electronic safety guard. The Hydraulic Triple Action Presses are manufactured with excellence and is designed with heavy duty construction, durable hydraulic components and sophisticated control systems. These triple action press is designed in a manner to provide accuracy in the finished product and also cut down the production cost. Our Triple Action Press is complete with user friendly control system and has the full functionality through PLC and Touch Screen. The pressure, stroke, speed and dwell can be set through PLC. These presses will be used for deep drawing (long draw) components, aerospace and aeronautical components, filter industries, and automobile industries. 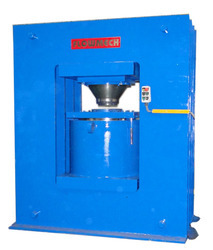 We are the leading manufacturer and exporter of Hydraulic Press. We are widely acknowledged as one of the prominent enterprises involved in manufacturing and supplying a wide assortment of Hydraulic Press. These products are available in various specifications so as to fulfill the diverse requirements put forth by the clients. In addition, the professionals working with us conduct varied checks on the products in order to ensure their flawless nature. We are the leading manufacturer and exporter of Double Action Hydraulic Press Machines. We offer Double Action Hydraulic Press (Blank Holder). We, at Flowmech, also manufacture double action hydraulic press with highly compact, rigid and space saving design. Double action hydraulic presses are equipped with PLC, L.V.D.T depth control automatic photo sensor. Double action hydraulic presses are used for manufacturing stainless steel sinks, geysers, A.C., L.P.G. Cylinders and other automobile draw components. 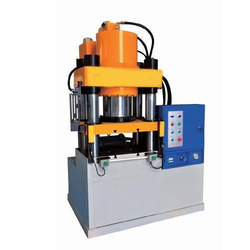 With this highly efficient double action hydraulic press, we are successfully satisfying the needs of our esteemed customers through specialized designs and latest trends. 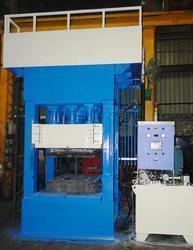 We manufacture the most efficient Single action hydraulic press that is suitable for various operations. 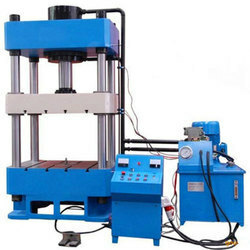 Single action hydraulic presses are highly rigid and compact to avoid any deflection during operation/load, space saving, high speed press suitable for operation like cold forming, coining, trimming, stamping, blanking, embossing, bending used in stainless steel sink industries, automobile industries etc. 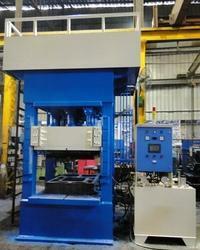 We manufacture single action hydraulic presses with utmost care to offer effective and durable output. We are the leading manufacturer and exporter ofHydraulic Forming Press. Our hydraulic forming press feature robust construction with eight point long slide guides for perfect guiding with centralize lubrication system. These also feature water cooled heat exchangers and PLC controls as well as come equipped with rubber tool bolsters that are mainly used for making of aluminum & stainless steel products against rubber pads. Our hydraulic forming presses also features advanced hydro electronic controls that gives better quality products with more production rate. Hydraulic forming press are made available up to 4000 Ton capacity as per customer's requirements. 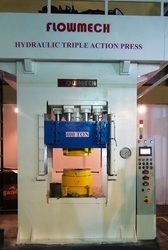 Our Triple Action Hydraulic Presses feature action that brings revolution in deep draw process. This is a high production press which comes with high speed, 4 pillar type construction used for long draw operations of sheet metal components. The triple action hydraulic press is also fully equipped with PLC or LVDT depth control, automatic photo sensors as well as electronic safety guards. Triple action hydraulic presses are also used for long draw components that require two times drawing, but in this machine long draw can be done at a time. We can manufacture two types of triple action hydraulic press. We are the leading manufacturer, supplier and exporter of Hydraulic "C" Frame Presses. 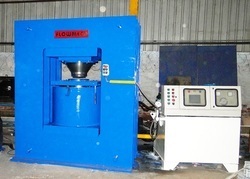 Hydraulic press can be manufactured by us up to 2000 ton capacity as per customer's requirement. These press can be used for simple pressing /coining /stamping/bending / forming / blanking as well as other applications including for die cushion. In cases of die cushion, die cushion cylinder with other system will be provided. Oil Reservoir 1 No. 400 LTRS. We are the leading manufacturer and exporter of Hydraulic Presses. We are dealing in Hydraulic Press and our product is made up of good quality. We are the leading manufacturer and exporter of Hydraulic Presses for S. S. Sink Plant Machinery. "FLOWMECH" Hydraulic Deep Draw Press (Blank Holder type) are the most vital equipment of a S. S. Kitchen Sink Plant. In simple words, it is the back bone of a sink plant. "FLOWMECH" make Hydraulic Deep Draw presses are highly rigid, compact, space saving in design. They are specially designed for uniform pressure on blank holder to avoid wrinkles during the process which improves the quality and productivity rate of products. The hydraulic deep draw presses are equipped with PLC , L.V.D.T depth control, photo sensor electronic safety guard, auto ejector. The hydraulic deep draw press is suitable for manufacturing stainless steel kitchen sinks, L.P.G. cylinders, geysers, A.C. and other automobile & utensils draw components. Bowl Size 16" X 14" / 20" X 16" / 18" X 16"
Looking for Hydraulic Sheet Metal Press ?